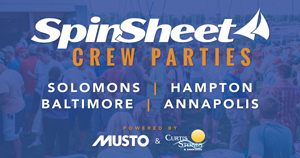 News for and about cruising sailors, their regional clubs and club directory, the 100-day SpinSheet Century Club challenge, and favorite sailing destinations on the Chesapeake Bay. The Cal, O’Day, and Ranger Owners of the Chesapeake Bay are planning a fall rendezvous in Harness Creek. Bay gourmets and Catalina 30 owners, Frank and Tina LeAnne, share some breakfast-making tips for small spaces. A fleet of four boats left Hampton, VA, on the morning of June 24 on a circumnavigation of the DelMarVa peninsula. The Annapolis Yacht Sales (AYS) annual rendezvous June 23-24 attracted 165 guests from as far away as the Bahamas. A total of 71 boats were represented. A parade of Dickersons sailed June 16 from Choptank Light to Oxford to begin a summer rendezvous celebrating the club’s 52nd anniversary. Ten tips and a guide for creating sailing checklists that help skippers and guests feel more confident and have more fun. The Wye River never gets old. We anchor and embrace the nature that surrounds us.There’s so much to explore, so much to experience.